The public is unlikely to be satisfied with the Supreme Court’s upcoming ruling on the 2010 Affordable Care Act – no matter what the Court decides. Whether the Court decides to uphold the entire law, overturn the entire law, or reject the “individual mandate” while allowing the rest of the law to remain in place, fewer than half of Americans say they would be happy with the decision. The public’s expected reactions track along partisan lines. 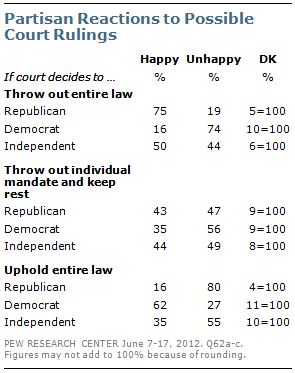 Most Democrats would be happy if the law is upheld, while most Republicans would be happy if it is thrown out. But the other widely discussed possibility – that the court could reject the part of the law that requires individuals to have health insurance while keeping the rest – does not satisfy either side. Among Democrats, 35% would be happy with this outcome, while 56% would be unhappy. Republicans, who have consistently opposed the individual mandate, are not much happier: 43% would be happy if the court strips only this provision, while 47% would be unhappy. For many partisans, only an “all or nothing” outcome will be acceptable. Four-in-ten (40%) Republicans say they will be happy only if the entire law is overturned, while another 29% would be happy with either overturning the entire law or just the mandate. Conversely, 39% of Democrats say they will be happy only if the entire law is upheld, while 17% would be happy with either keeping the entire law or removing the mandate but keeping the other elements. The latest national survey by the Pew Research Center for the People & the Press, conducted June 7-17 among 2,013 adults, finds that none of these outcomes is particularly appealing to independents, though more would like to see the law entirely overturned than kept in place. Half (50%) of independents say they would be happy if the entire law is overturned, while only 35% would be happy if the entire law is upheld. Independents have a divided reaction to the court throwing out the individual mandate while upholding the rest of the law (44% happy, 49% unhappy). What If the Court Just Struck Down the Mandate? The prospect that the Supreme Court might strike down the individual insurance mandate while leaving the rest of the law in place draws negative reactions from both supporters and opponents of the 2010 law. 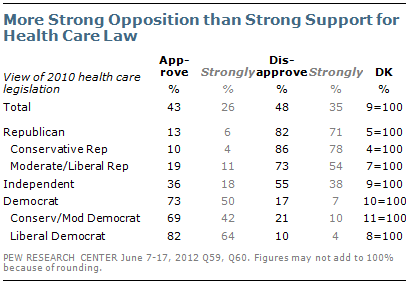 Overall, more continue to disapprove (48%) than approve (43%) of the 2010 health care bill. That is little changed from April (41% approve vs. 49% disapprove). Half (50%) of the law’s opponents, and roughly the same share of its supporters (54%), say they would be unhappy if the court throws out the individual mandate but upholds the rest of the law. 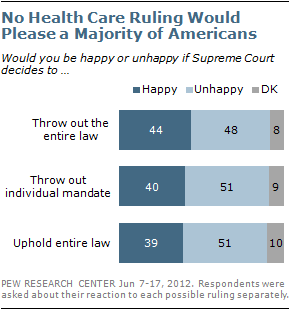 Many Americans do not have a clear understanding of what’s in the health care law. About one-in-five (18%) say they understand the law very well and 49% say they understand it somewhat well; nearly a third (31%) say they understand it not too well or not at all well. Those who feel they understand the law are the most skeptical of a ruling that just strikes out the individual mandate. By a 61% to 37% margin, those who feel they understand what’s in the law very well – a group that includes roughly equal percentages Republicans and Democrats – say they would be unhappy if the individual mandate alone is thrown out. Among the much larger share of the public that does not understand the law as well, reactions toward striking down the individual mandate while upholding the rest of the law are more mixed. More than two years after its passage, the 2010 Affordable Care Act continues to spark strong feelings from most Americans, particularly among opponents. Overall, 35% of Americans say they disapprove of the law very strongly; that represents nearly three-quarters of the 48% who disapprove of the bill. By comparison, 26% of Americans approve of the law very strongly, or about 60% of the bill’s supporters. Among political independents, more disapprove (55%) than approve (36%) of the law in general, and strong opposition to the measure exceeds strong support by about two-to-one (38% vs. 18%). Republicans are more likely to disapprove of the law (82%) than Democrats are to approve of it (73%). The gap in intensity is even larger. Only half (50%) of Democrats strongly approve of the law, compared with strong disapproval from 71% of Republicans. Before the end of its current term, the Supreme Court also is expected to rule on Arizona’s immigration law, which requires police to determine the immigration status of people they have stopped whom they suspect might be in this country illegally. Most Americans continue to support the Arizona law: 58% approve while just 38% disapprove. This is slightly less support than the 64% who approved when the law was first passed in 2010. At the same time, when the public is asked about priorities for dealing with illegal immigration, a plurality (42%) gives equal priority to tighter restrictions on illegal immigration and creating a path to citizenship for people in this country illegally. About a quarter (28%) say tougher border security and stricter law enforcement alone should be the priority; about the same percentage (27%) says developing a way for illegal immigrants to become citizens alone should be the priority. These views have changed little since 2010. Opinions about Arizona’s immigration law – as well as priorities for dealing with illegal immigration – are divided along ethnic and racial lines. Three-quarters (75%) of Hispanics oppose the law, as do 56% of blacks, while whites support the law by greater than two-to-one (69% to 28%). 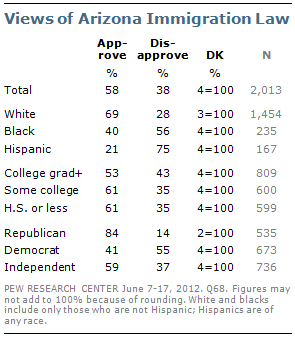 Fully 84% of Republicans approve of Arizona’s immigration law, unchanged since 2010. But support has dropped among both Democrats and independents. In June 2010, 65% of independents approved of the recently passed state legislation – that has slipped to 59% today. And in 2010, Democrats were split over the new Arizona law – 50% approved while 46% disapproved. Today, most Democrats disapprove by a 55% to 41% margin. 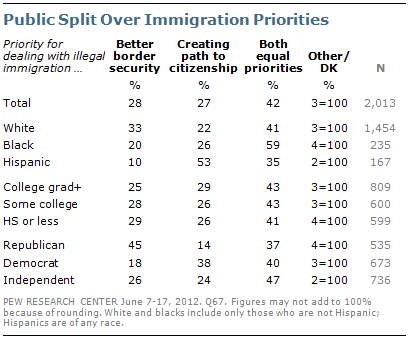 In terms of priorities for dealing with illegal immigration, 53% of Hispanics say that creating a path to citizenship should be the priority for dealing with illegal immigration; another 35% say the priority should be a path to citizenship, along with better border security and stepped up enforcement of immigration laws. Most blacks (59%) and a plurality of whites (41%) say that both enforcement and creating a path to citizenship should be given equal priority. One-third (33%) of whites say that better border security and enforcement of immigration laws should be the sole priority.